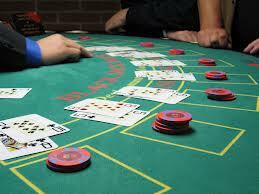 The game of Blackjack is being played in casinos all over the world including online these days. Its popularity can be attributed to many reasons, but most likely because it is a game that the player can use his or her skill to make money. Many casino games rely on pure luck and fate of the dealer to win. These games while fun, can be a drain on your wallet over the course of time. If you have been looking for a game to win more money at, or just need a few tips to beat Blackjack, you’ve come to the right place. This article will help guide you through the very basics of Blackjack and finish off with an easy to understand strategy that will help you lower the house advantage and make more money. The game in its simplest form requires the player to get as close to 21 without going over while beating the dealer at the same time. The player will have many options during the course of hand to try and achieve this goal. Depending on which casino you play at, you may have up to 8 decks of cards used in a game. These decks are all standard 52 card decks and each card is given a value. All number cards 2-9 count as face value. Tens, Jacks, Queens and Kings are worth 10 and the Aces are worth 1 or 11. The game starts with the dealer giving two cards to everyone playing including themselves. One card is face up and one face down for the dealer’s hand. After all cards have been dealt out, the players now have options to improve their hand. Stand: At any point in the hand, the player may choose to stand. This means that you are happy with your hand and wish to receive no more cards. Hit: If you would like another card, you take a hit. You are dealt one more card at this point and can now hit again so long as you don’t go over 21. If you do not want to take another card, you stand. You can hit as many times as you like so long as you don’t go over 21. You will have other options as well that will be covered in the strategy portion since they require more knowledge on when to utilize these plays. Once all the players have made their decisions, it is the dealers turn. The dealer will have strict rules to which they must abide by. The standard and most common rules are that the dealer must hit on anything 16 or below and stay on anything 17 or higher. Some casino rules may allow the dealer to hit on a soft 17. This is a total of 17 with an Ace in the hand. If the dealers hand beats your total, then you lose your bet and move on to the next hand. If your hand is better than the dealers or they bust, you win double your wage. If you are dealt a 21, you automatically win regardless of what the dealer has. If you hit to a 21 and the dealer gets 21 as well, you would push and receive your money back for that hand. That’s the basics of how to play Blackjack. Now let’s get into some strategy to start making more money at the game. Let’s start by discussing why Blackjack is one of the better casino games for the player. All casino games have some type of house edge that makes them profitable for the house. This means in the long run, the casinos will make money off every single game offered. These edges can be minute or very large. In some cases the casinos edge can be as high as 15%. These are games you want to stay away from. Blackjack has one of the lowest house advantages of any game in a casino. It will vary slightly based on the house rules, but an average Blackjack game will have a casino edge of around .30%. This is by far one of the best you will find at a casino. What’s even better is that by employing certain strategies, you can lower this house advantage and in some cases turn it into a player advantage. Believe it or not there is a simple strategy that you can use to make the optimal decision every time at Blackjack. This strategy was mathematically formulated and has been proven to work. The formula takes into account what the dealers card, then dictates what the player should do based on this information. This strategy is a bit complex, but here is a chart that will show you exactly what to do. No need to memorize a spreadsheet or become the next “Rain Man”. This chart is very easy to use and details every decision based on what the dealer is showing. Doubling down is a way to try and win extra money in a hand of Blackjack. When you double down, you are required to place another bet exact to your original you placed at the beginning of the hand. You are then given one, and only one more card. This is now your total regardless of what you were given. Many players don’t use this option properly and it can be costly in certain situations. You always want to double down when you are dealt an 11unless the dealer is showing an Ace. The chart provided will detail when you should be using the double down. Follow it and you will be making the right every single time. If you are dealt the same two cards such as two 8s, you are given the option of splitting the two cards and making two new hands. You are required to place another bet similar to your original to perform this action just as you would be when you double down. You will now have two hands which to play and each will have the same rules as any normal hand of Blackjack. You can hit, stand, double down etc. There are certain times to use this strategy that many players overlook and fail to do. First is when you are dealt two 8s. You always split two 8s since having this combination gives you a total of 16. Having a 16 is the worst possible starting hand in Blackjack and by splitting them; you give yourself the possibility of making two better hands to play. You also always want to split when you are dealt two Aces. While two Aces may look pretty, it’s not a very good hand to play. You are also giving yourself the chance to make 21 two times. The chart provided will show exactly when to split. If the dealer is showing an Ace, you are given he option to take insurance. The insurance is basically placing a bet that the dealer will have a Ten as the hole card. If the Ten does show up, then you win this bet, but lose your original bet that was placed at the beginning of the hand. The strategy to use when offered insurance is very simple. Don’t ever take this bet! It is one of the worse bets a player can make due to its poor odds and should always be avoided. Aside from knowing what decisions to make based on your cards, one of the best strategies to use while playing Blackjack is called a betting strategy. This is a way of betting that is theoretically supposed to win in the long run. There are many betting strategies that you can find doing simple research, however, one that has been proven over the course of time is called the Martingale Betting Strategy. To use this betting strategy you either double your bet when you lose a hand or keep it the same when you win. The theory behind this strategy is that you will always at least break even since you will win your money back on losing hands by making the next bet double. Add in that you will win 3:2 on dealt Blackjacks and can win more when you double down and split, you should almost always come out ahead. Let’s use an example to show exactly how the Martingale Betting Strategy works. We start at a baseline for our wagers; this will be the basis for all future bets. For this example we will start out by placing a bet of $1. We are dealt the hand and we wind up winning. We now have a profit of $1 and since we won the hand, this strategy dictates we keep our next bet the same. We again place a $1 bet on the next hand. This time we are unlucky and dealer beats our hand. We are back to even at this point and since we lost the hand, our next bet must be double. We bet $2 on the next hand and the dealer is dealt a 21 and we lose yet again. At this point we are down $2 and following the guidelines of the strategy we have to double our bet once again. This is where most players use this strategy incorrectly. Some think that they only double the initial every time they lose. You must double the previous bet placed on, lost hands, not just the initial bet we start out with. Since we lost $2 on the past hand, we must now double our next bet to $4. If we lose this one, our next hand should be an $8 bet and so on. However we were lucky enough to win this hand and have won all our money back and now back to even for the day. And, since we won the hand, we can go back to betting the original $1. It’s a rather simple strategy to use as you can see. The important part is to make sure you double the previous losing bet not just the original amount you started betting with. If you stick to the rules of this strategy, you should at least always break even.